Note: Other language versions may not be as current as the English edition. 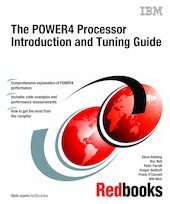 This IBM Redbooks publication is designed to familiarize you with the IBM eServer pSeries POWER4 microarchitecture and to provide you with the information necessary to exploit the new high-end servers based on this architecture. The eight to 32-way symmetric multiprocessing (SMP) pSeries 690 Model 681 will be the first POWER4 system to be available. Thus, most analysis presented in this publication refers to this system. While this publication is decidedly technical in nature, the fundamental concepts are presented from a user point of view and numerous examples are provided to reinforce these concepts.